Sorry for the delay in posting. The truth of the matter is I started this project in addition to a demanding full-time job and have been juggling the two for almost three years now. My body and mind told me I needed some downtime and I’ve taken a few weekends off. The good news: I’m back on track and making progress toward some goals. As some of you know, I recently held a new logo design contest that will tie into work I have planned for the future. The whole project took a turn that I hadn’t anticipated so I had to retool a bit. More on that in a later post. Okay, not brand-spanking new but I recently made a presentation on the 140th anniversary (May 20) of the United States as one of the original signatory countries on the Treaty of the Meter. It gave the International Bureau of Weights and Measures the authority to set metric standards (or SI as it is known elsewhere) for the rest of the world. It’s still active on various fronts including efforts to define the kilogram scientifically (currently the kilogram is defined by a piece of metal that resides in its care with several other mass “standards” residing around the world). The presentation wasn’t completely new as I gave it to a smattering (okay, smatterin’ is being generous…) of people last spring. My audience this time was a group of doctors and health-care workers at our county hospital. It has a lecture series every Tuesday and I offered myself up. As our lack of metric adoption has health implications every single day (see this previous blog), I could really see a future where health-care professionals could help propel the issue forward. I was paid the compliment afterward of being told “It was like watching something on the history channel.” I took that as a compliment. Many days I get an alert from Google if “metric system” pops up on the web somewhere. Granted, sometimes it references “bio-metric systems” or goes a little off track in some ways, but it does capture most everything I want to see (except for lines in comic strips, since it can’t read those words). This is the tip of a growing iceberg. Interestingly, it also found a trivia quiz from Macleans.ca, that included a second question based on metric system knowledge. I recently received some cards aimed at helping children here in the U.S. learn basic metric units. The bottom line as far as I’m concerned, is the more children are familiar with the concepts of metric measures, the more likely they’ll be to accept and use them. Interestingly, the temperature unit used on the cards is Kelvin rather than Celsius. This hit me as odd since I’ve taught myself Celsius as my primary temperature reference. Meanwhile, Kelvin is an absolute measure where 0 is the temperature at which atomic motion stops (I’m glossing over the details here) or −273.15 °C. According to my research both temperature Kelvin (or K) and Celsius are often reported together for scientific purposes. 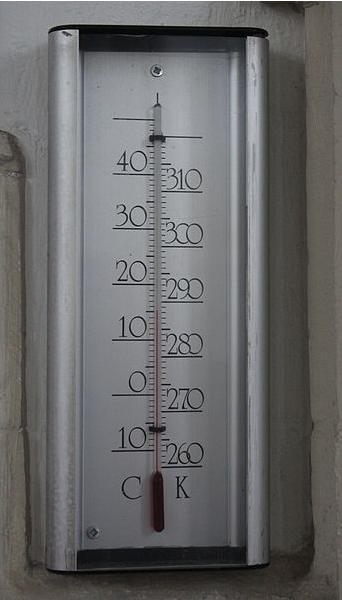 The unit of Celsius temperature is the degree Celsius, symbol °C, which is by definition equal in magnitude to the kelvin. A difference or interval of temperature may be expressed in kelvins or in degrees Celsius (13th CGPM*, 1967). To be honest, some of the associated information is way over my head such as its reference to the “triple point of water.” I’m sure I can look it up if it turns out that I need to know that particular tidbit of information. 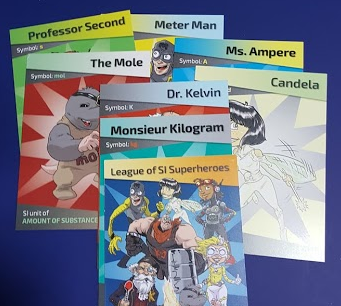 If you’d like more information on the superhero cards pictured above, go to the NIST kid’s pages that also include videos with the associated superheroes.